All dig Charters are on sale. Digs fill up fast so sign up now. Sign up is easy. First, choose the week you would like to go on a chartered dig. Then, click "Add To Cart" to pay online or click "Pay By Check". Upon selecting a payment option you will be directed to the sign-up form. Once completed you will receive a confirmation email. The recommended supplies list and safety agreement form, which is due upon arrival at camp, can be found below. In the event a cancellation is required before June 15 you will be refunded the amount paid less 10%. Anyone under 18 must be accompanied by an adult. Charters generally start at 5:00 p.m. Sunday in Marmarth ND and end at 9:00 a.m. the following Sunday. Meals, lodging, and transportation to field sites is included with each dig charter. Charters are limited to 20 participants so sign up now! To reserve charter dates with $200 down and pay in full later, click: Reserve Dig Dates. *Student Discount! College/high school: $900/student for full Charter. Proof of status required upon arrival (schedule /ID/etc). For single student use Promo Code: STUDENT Contact us for multiple students. *Group Discount! Groups of 3 or more: $900.00/person for full Charter. Contact us for promo code and instructions. The first few weeks of the dig season are great for new discoveries. Erosion has been hard at work exposing new fossil material. Charter begins Sunday 6/23/19 at 4:00 p.m. in Marmarth ND and ends 6/30/19 at 9:00 a.m. For more information click "Learn More!" Must be 14 or older to participate. If you prefer to pay by check please click here. The first few weeks of the dig season are great for new discoveries. 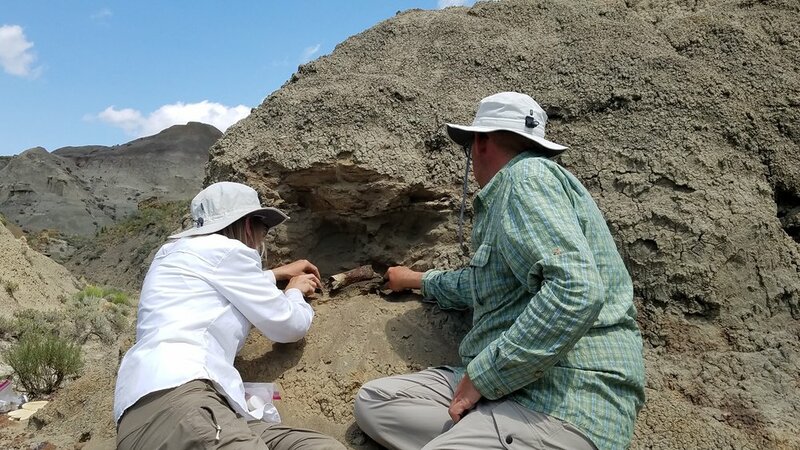 Erosion has been hard at work exposing new fossil material. Charter begins Sunday 7/07/19 at 4:00 p.m. in Marmarth ND and ends 7/14/19 at 9:00 a.m. For more information click "Learn More!" Must be 14 or older to participate. If you prefer to pay by check please click here. While new discoveries occur in the field every week by this time the lab is also in full swing. Charter begins Sunday 7/14/19 at 4:00 p.m. in Marmarth ND and ends 7/21/19 at 9:00 a.m. For more information click "Learn More!" Must be 14 or older to participate. If you prefer to pay by check please click here. By the end of July excavations have likely yielded significant fossils for lab preparation. While new discoveries occur in the field every week by this time the lab is also in full swing. Charter begins Sunday 7/21/19 at 4:00 p.m. in Marmarth ND and ends 7/28/19 at 9:00 a.m. For more information click "Learn More!" Must be 14 or older to participate. If you prefer to pay by check please click here. Information on the high school group digs for the 2019 season can be found here: HS Dig Week. All student groups must be approved.